Hadrian´s Villa, a gigantic structure of buildings dating back to early 2nd century AD, situated some 28 km north of Rome at the foot of the Appenine mountain range, is in many ways a truly remarkable place. 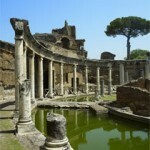 It served as the summer residence for the emperors in this phase of Rome´s history. What struck me in particular was the so-called Maritime Theatre, which seems to have been a place for contemplation. Grandious, with daring and sophisticated architecture and so on, but what really set it out was a sense of familiarity. I had to go back to the place twice during my afternoon stay in the enormous villa complex. You get the feeling, over the millennia, that here must have been people who were interested in contemplative practice. It may of course be that my phantasy ran away with me, but the place sort of invited to meditate and reflect. What it was I don´t know, but I felt that I could easily spend hours on the spot, meditating or just sitting there. Marcus Aurelius. I don´t know what sort of meditative techniques, if any, they practiced, but I walked away surprised, and quite certain that these people must have been at times also deeply and seriously interested in reflecting upon oneself and life. Interesting! Would like to go to the Maritime Theatre some day. Quite certainly, there are places that have a marked meditative atmosphere, and invite you to sit, meditate and reflect on life. I have had that feeling in a handful of places far apart from each other. Most recently, it was St. Paul’s Cathedral in London. It is right in the middle of the city, next to a busy road, has lots of tourists sitting outside and wandering inside, but still, it had a silent, deeply touching atmosphere that made me return soon. At the same time, I agree that we may often project things from ourselves into our environment. Sometimes when I hear people talking about the ‘spiritual presence’ of a guru, or of a whole city, I find myself flinching with skepticism. Once in Rishikesh, India, a Western woman said while addressing an audience, “every molecule in this city is divine”, and I wasn’t quite sure I agree. I suppose there aren’t any objective tools to measure this. You go by your intuition, and sometimes you are right and sometimes your sentiments cloud your judgement. Thoughtful comment, Kaif. A dose of skepticism, also towards one´s own experiences, is not at all bad. But I agree that you can run into a meditative presence connected to certain places. Then again, I may be wrong. On this occasion it was the surprise at the experience that made me think it wasn´t just my own expectations being fulfilled. But at the same time – it doesn´t really matter, does it? We´ll never really get to know. Whatever the truth about such things, I read this with great interest, since I will be visiting Rome very soon. I suppose I will now be predisposed to experience something contemplative when I get there. And wherever the source of this atmosphere lies – in me or in the Maritime Theatre or both – it seems to me a good thing anyway. ← Stress and ageing: A question of attitude?